The merry month of May, and Venus is still the brightest object in the sky. It has been incredibly bright as it has got closer to us, despite the fact that it has become quite a slender crescent. It’s been with us for five months now but it is time to say goodbye as it starts to overtake us and disappear in front of the Sun. It is visible nearly all month, and very easy to find above the glow of sunset. We still have two other planets in our skies and these are very easy to spot if you know where to look. Just to make sure, let’s start with a pattern of stars everyone surely knows: the Plough or Big Dipper, the “saucepan“ shape of stars that is actually part of the constellation of Ursa Major or the Great Bear. It is quite high in the south east now and looking in that direction, the saucepan is sitting with the handle pointing downwards. It is fairly well known that if you take the side opposite to the handle and extend it in a line upwards, you will come to the North Star or Polaris, but if you extend the line downwards and keep going till you get to a bright orange “star”, you will have found Mars. It really is a vivid colour although it is starting to get more distant and hence less bright now. This little planet, about half the diameter of the Earth, has intrigued mankind for generations. We have sent more probes to Mars than any other planet and the rover Opportunity is still exploring there now, having spent three years driving to a new destination – nearly as slow as a campervan! The scariest invaders from our solar system always came from Mars – who could ever be frightened of a Venusian? – despite the fact that its atmosphere is so thin that it would be quite a good vacuum here on Earth. Make the most of it though, because we are leaving Mars behind now and it will be gone next month. Turning back to the Plough, if you take the curve of the handle and follow a similarly curved line downwards, you will “arc” down to the star Arcturus. Keep going and you arrive at another bright star, Spica. 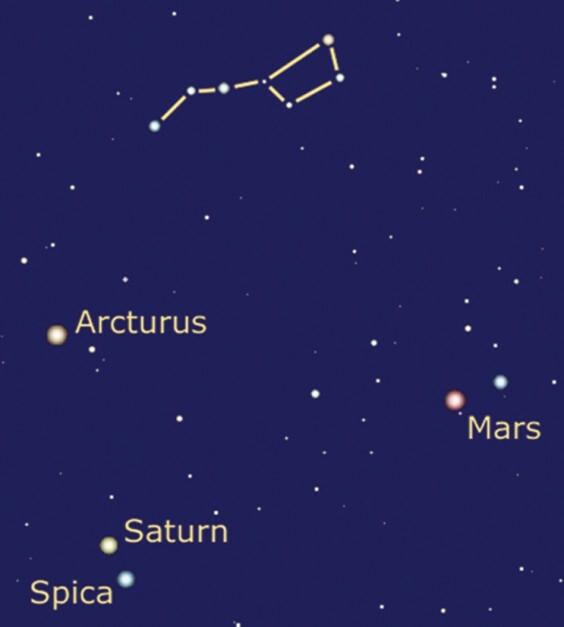 This is a well-known method of identifying these two stars but this year Saturn is sitting next to Spica, although it is much brighter and more yellow. This huge ball of gas is a spectacular sight in a telescope but is also a good target for binoculars, its enormous moon Titan being fairly easy to spot. Saturn is also being investigated by a probe at the moment. Called Cassini, it has been sending wonderful images of the planet and its rings back to us for seven years now and it launched the Huygens probe to land on Titan with great success. We are unlikely to be invaded by Saturnians as there is no solid surface – but Titans? As an aside, the most bizarre headline I saw in all the Titanic frenzy recently was “Did the Moon sink the Titanic?” Now there’s a challenge for James Cameron!